“The hardest part was to come. Turning the field work into a map would turn out to be just as laborious,” Mason says. The tech and techniques involved in the Grand Canyon map are as fascinating as they are unfathomable to software-driven mappers today — for starters, translating aerial photos and surveying information into contouring sheets by hand etching them. Those sheets were then condensed into one map at a scale of 2,000 feet per inch with 50-foot contours. 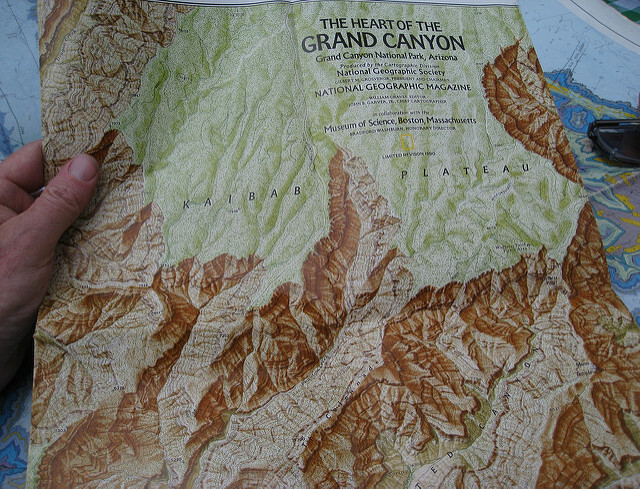 You’ll have to check out the book for more on the artistry of rendering the curves and dips of the canyon leading to the published version of the map, which was not a commercial success. As map lovers who are journalists, Mason and Miller focused on digging up the stories behind the maps rather than on history or cartography. Some of the maps she previewed included pioneering neuroscientist Santiago Ramón y Cajal’s 19th-century map of the retina and Jerry Gretzinger’s map of a fictional world — 50 years in the making and counting. You’ll be able to wrap your hands around the hardcover “All Over the Map: A Cartographic Odyssey” on October 23, 2018 — in time to put it on your holiday gift lists and make room on the coffee table. This entry was posted in data and tagged All Over the Map: A Cartographic Odyssey, maps, national geographic by . Bookmark the permalink.